Adobe is showing off a great new product for mobile developers at the SXSW conference in Austin this weekend. I caught the announcement and have been using it to achieve a better workflow. 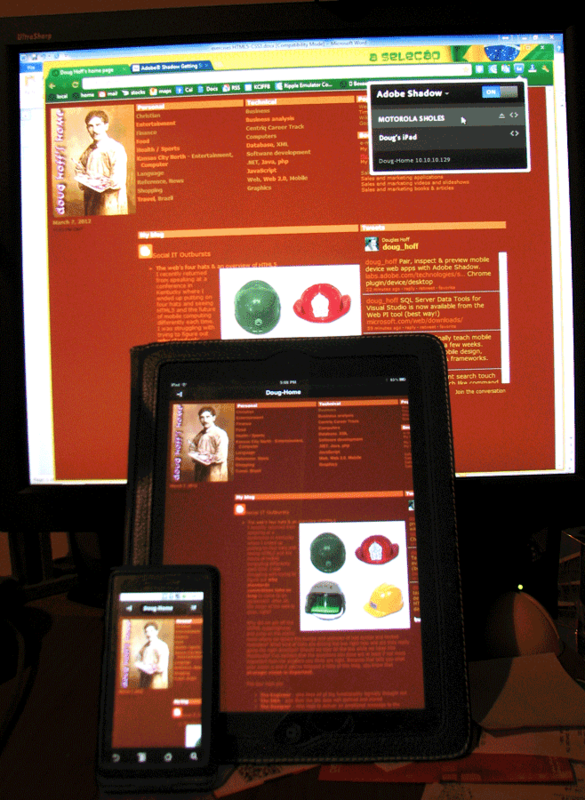 It seems the more devices you need to test, the better it works. But I'm just working with an iPad and and Android phone. It's great to sit back and watch all the screens update in real time all at once. and it's still a 1.0 product with many features to come in the future. Some of the things you start realizing when you leave Shadow open while you browse are that some sites don't do a good mobile design, some require constant authentication, some use AJAX to fake a new page request and which ones have a great sense of adaptive design. The main feature is a Chrome plug-in that talks to your iOS or Android app so that when you launch your Windows or Mac Shadow application with the apps talking to your local network, the apps will "shadow" what you do on your desktop. The more you like Developer Tools in Chrome the more you will like the product because it shows a webkit Developer Tools based window for your remote device. The product was a very well timed conjunction of talent from the weinre open source code that was acquired through Adobe's purchase of Nitobi, the maker of PhoneGap and Adobe's BrowserLab. Adobe Shadow is free also and looks to get only better as they add support for Firefox and localhost development environments. The 1.0 version is posted at the Adobe Labs.This will definitely a product to work with in my new Mobile Web Application Development using jQuery Mobile course here at Centriq.